Want to know what's been going on around here? I read the Secret Diary of a Garden Fairy to find out. What a day we had. First, Carol came out and harvested green beans when she wasn't supposed to be here. Then there was a gigantic thunderstorm that turned the day into night and knocked down the sweet corn. Granny Gus McGarden was just beside herself with upset over it all. Well, Carol finally came out to see if she could get the sweet corn to be upright again. I am telling you she did a lazy thing to do it. She brought out ONE stake and proceeded to pound that into the ground at one corner of the little corn patch. We saw her coming and made sure the young ones were out of the way first. Then she used some silly plastic-y twine-y string-y stuff to sort of lasso all the corn in a big loop and tie it to the one stake. What a mess it still is. We hope she comes back and fixes it right. Does she really expect to still harvest any sweet corn? Carol is still hanging around. We've deduced she is on some kind of vacation where you hang around and torment garden fairies or something like that. Today she came out and did a full trimming and mowing of the lawn. It was the 28th mowing of the season, which is a new record of some kind. We want to blog about it, and will in time. We were so excited today when Carol showed up with bags of mulch for the paths in the vegetable garden. Those paths are getting so bare and make the whole garden look a mess. Granny Gus McGarden is almost embarrassed to have company come back there. Well, our excitement was short-lived because all Carol did was stack the bags of mulch into three fairly neat stacks. At least the bags are neatly stacked. We'll give her that. We garden fairies wish we could spread the mulch but we are garden fairies. Carol was here again. This time she harvested all kinds of green beans, squash, peppers, cucumbers, and even tomatoes. She was so proud of it all she took pictures. Then she left again. But then she came back and planted some lilies she had purchased on Saturday. She sure takes her time sometimes when it comes to planting plants she has paid money for. Later another big storm blew in and then another one and well, we garden fairies were soaked by it all. Over four inches of rain. Granny Gus McGarden is very thankful Carol has raised beds in her vegetable garden. Otherwise, Granny said everything would have drowned by now. Pretty quiet day around here but it was so hot, who wanted to do anything? We thought for sure we would be safe to just lounge around in the shady areas of the lawn, drinking iced clover tea and telling stories of what goes on around here, but then late in the day, here came Carol with the mower. 29th mowing this season. And so hot. We think she mowed because it is going to rain again. She seems to rush out and mow anytime they say it is going to be rainy. She seems obsessed with the mere thought of her lawn being overgrown and boy-oh-boy is it growing with all the rain we've been getting. Anyway, we were scrambling out of the way and it was oh-so-hot. 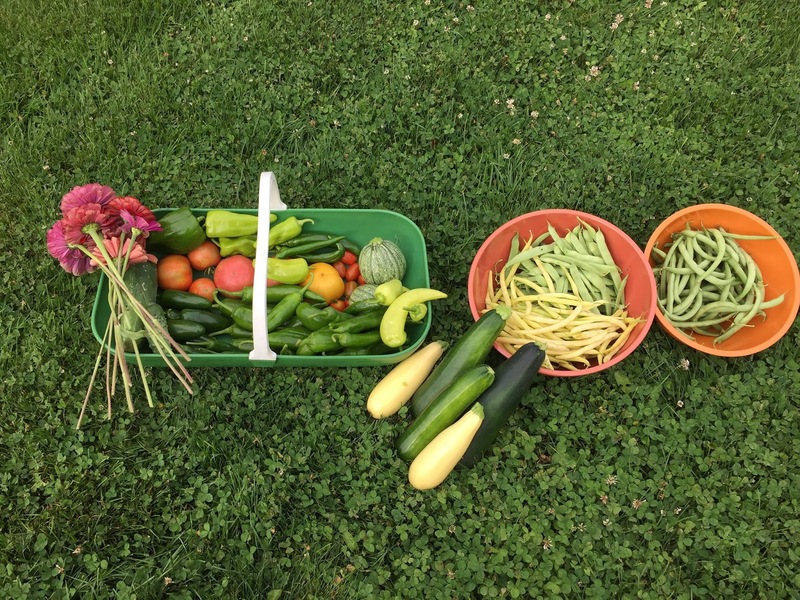 Oh, and we found that picture of Carol's harvest from the other day. I always enjoy your posts! Beautiful harvest...here in Central Florida, everything's done except okra and sweet potatoes. Just waiting for September, when I can plant again. So nice to hear from the garden fairies! I hope they leave their diary out semi-on purpose for our benefit and don't mind that we read it. 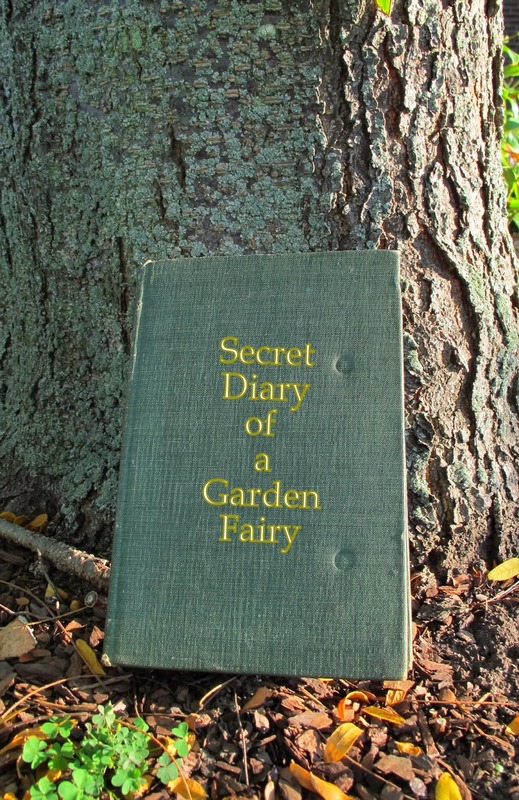 I haven't found a garden fairy diary just yet, so I must not be looking in the right places. That Carol has been a busy girl for being on vacation.